KU: Randle 23-105; Tucker 1-4; Nwabuisi 1-1; Barmann 8-minus 5. NU: C.Ross 19-107; Jackson 7-28; Green 1-2; J.Dailey 5-2. KU: Rideau 5-40; Anderson 5-35; Heaggans 4-66; Randle 4-22; Gordon 3-21; Simmons 3-16. NU: R.Pilkington 8-113; C.Ross 3-37; M.LeFlore 2-12; G.Mulkey 1-9; M.Herian 1-8; D.Todd 1-4. Nebraska relied on a stingy defensive performance and the steady play of junior running back Cory Ross to defeat Kansas, 14-8. 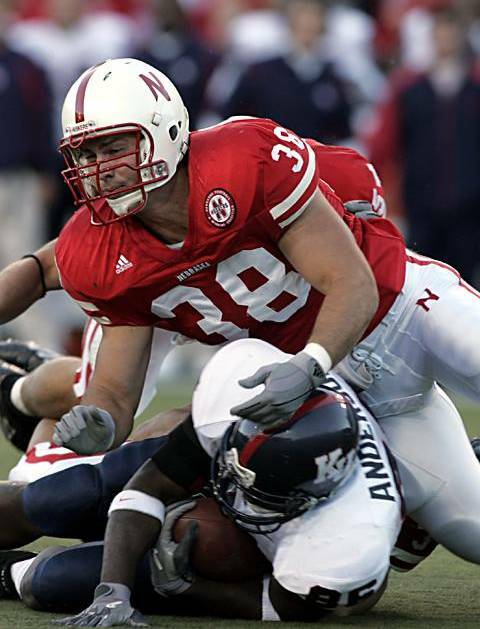 Ross produced his third 100-yard rushing effort of 2004, leading the Huskers with 107 yards rushing on 19 carries and a touchdown. He also caught three passes for 37 yards, including a 14-yard touchdown reception in the third quarter that gave Nebraska the lead for good. Junior wide receiver Ross Pilkington also turned in a notable performance, racking up 113 yards on eight receptions. Meanwhile, the Blackshirts did not allow a KU touchdown and held the Jayhawks to 305 yards and just 149 in the second half. Junior cornerback Fabian Washington recorded his third interception of the season, and the Husker defense totaled 11 pass breakups, including three each from Washington and junior safety Daniel Bullocks. I am disappointed with the way our offense is being coached. Perhaps I expected too much. Growing pains. Which means you're going to have to grin and bear it while Joe Dailey continues to go hot and cold and making the same mistakes. The Huskers are going to go as far as their down-and-dirty defense takes them. After four games, it continues to be obvious that the running game remains Nebraska's best bet to move the football consistently. I think it's way too early to push the panic button. You can't judge this operation until Callahan starts fitting his recruits into his offense. Callahan either needs to figure out how to get better play out of his current QB or have the courage to make a change. It's time to take the Kansas offense back to the drawing board. It has become too predictable.